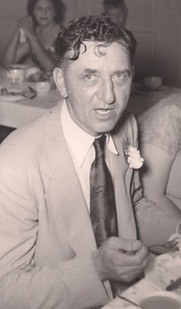 Grampa Frank was born in Chicago, October 4, 1899. He was very tall and as skinny as a rail, and worked his whole life for a commuter railroad, the Chicago and Eastern Illinois. Grampa Frank was also a baseball player. He pitched and played the outfield and was a first baseman for mostly local teams, but had one season in Nebraska as a professional. We found his contract in a stash of odds and ends in a closet sometime after he had passed away. As a pro ballplayer, Grampa went by the name Frank Wilson, which was also the brand of ball glove he used. He played for a minor league club in the old St. Louis Browns organization. Long after Frank’s playing days, the Browns moved to Baltimore and became the Orioles. Others in the extended family knew Grampa Frank as Uncle Hen Hen. I have no idea where that name came from or what it referred to. I do know that during the Great Depression, when his sister Mary, who had five sons, lost her husband, Grampa helped keep watch over her family and made sure all the bills were paid. Being with the railroad he worked steadily through the depression. Grampa was a family man. It seemed Grampa Frank could do almost anything. In horseshoes, he once threw twenty-one ringers in a row. When my father took violin lessons as a boy, Frank, never having played an instrument, taught himself how to bow and play a few simple melodies. I learned this after I got my dad’s old fiddle the night before I started lessons while in the fourth grade. Frank hadn’t picked up a violin for years, but played “Pop Goes the Weasel,” and “Twinkle Little Star” to our utter amazement. Grampa Frank could make a coin disappear from the palm of his hand, and have it emerge from my brother’s pants pocket, who was off in another room. I was looking under the kitchen table for the quarter, when he called my brother in and sure enough, when my brother reached into his pocket, out came the shiny quarter with the same black magic-marker dot on George Washington’s head. I don’t think my brother ever knew that Grampa had tucked it into his pocket earlier without him knowing. At bedtime, we each got to keep a twenty-five cent piece with a little black dot on it. And he could juggle. I once saw him juggle five rubber balls. He was better with three, but he was working on five. Sometimes it was walnuts, or other things. One time I saw him spin a top and in one motion, scoop it up from the floor on the pull-string, flick the string and pop the spinning top into the air and catch it in his shirt pocket, all the while with a glowing, unfiltered Camel cigarette dangling from his lip. At his house in Cicero one evening after supper, he found me in the kitchen playing with a toy fire truck or something. He whispered, “Don’t say anything to anybody,” and he motioned me with his head to follow him out the kitchen through the back porch door. Down the steps we went, around the side of the porch to where the basement door was. In we went. It was dark and musty. We walked past the furnace to a room that was once the coal room, but had since become a room to store hunting gear and fishing tackle, a boat motor, tools and all sorts of other neat stuff that could capture any young boy’s imagination in an instant. That’s where Grampa also kept a stash of United States Army C rations left over from the war. I guess you could purchase this stuff from any army surplus store well after the war had ended. And I’m guessing that maybe he bought these rations to take along on fishing and hunting trips. Or maybe he kept them in the basement in case of an air raid or something. Grampa reached beneath the work bench and pulled aside a dusty canvas tarp. He rooted around awhile and produced two olive drab-colored cans. He showed me how to open one of them by using the tiny key attached to the top of the can, but I struggled turning open the lid. He had the other can opened quickly and then helped me finish the job of opening mine. Inside was a stack of circular unsalted soda crackers and a packet of jelly. He wiped sweet jelly on my cracker and I took a bite. Frank’s can had some sort of potted meat in it and he wiped that onto his cracker and popped it into his mouth. We chewed, enjoying our snack, and our little secret. Of course, I had no idea he had snuck each of my brothers down there earlier, one by one, for the very same adventure. “Don’t say anything to anybody,” he whispered. We giggled and chewed. When our family moved to unincorporated LaGrange, Illinois, Gramma and Grampa made the drive west from Cicero at least once a week. We played ball in our new back yard, and he helped out with homework. He knew how to help me understand algebra and he knew how to make a good paragraph for a writing assignment. Grampa knew how to make a poem. I remember him trying to explain metaphor to me in a way that I might understand. “Words mean things,” he said. “But sometimes they mean other things.” And I still think about this. I looked up to him and he gazed straight down toward me, part serious, and also part the other thing; the thing I still remember when his eyes were smiling, but his mouth was not. We stopped.